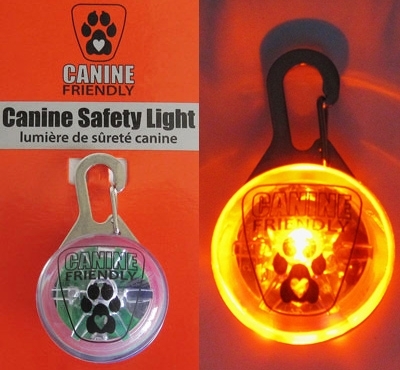 Gwen suggests the Canine Safety Light is an excellent way to increase your nighttime visibility. The safety orange light source works in both a continuous and flash mode. Just press once to turn on the continuous mode or twice for the flash mode. Pressing the light a third time will turn it off. Clip one to your dog's collar and another to yourself for additional safety while walking at night.